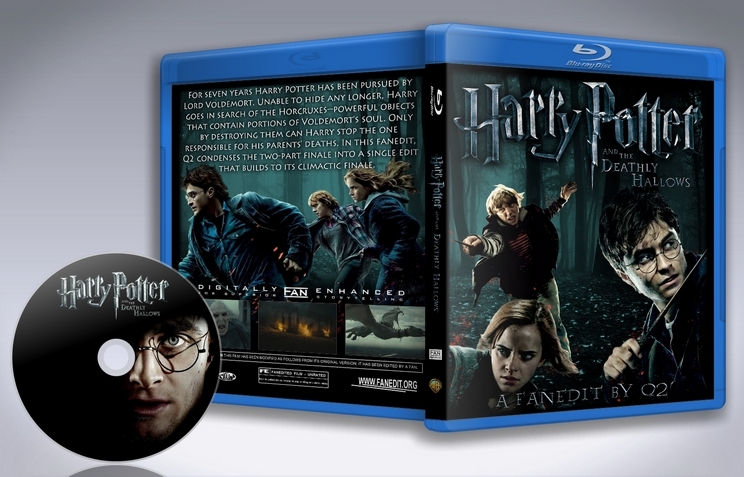 To combine both Deathly Hallows films into a single one. Too many to mention. The big changes include: Hermoine erasing her parents memory, the romance between Ron and Hermoine, Harry's wand being broken, and the epilogue. Basically, any story elements that seemed to pad the story was cut. Q2 comes in with the big save. 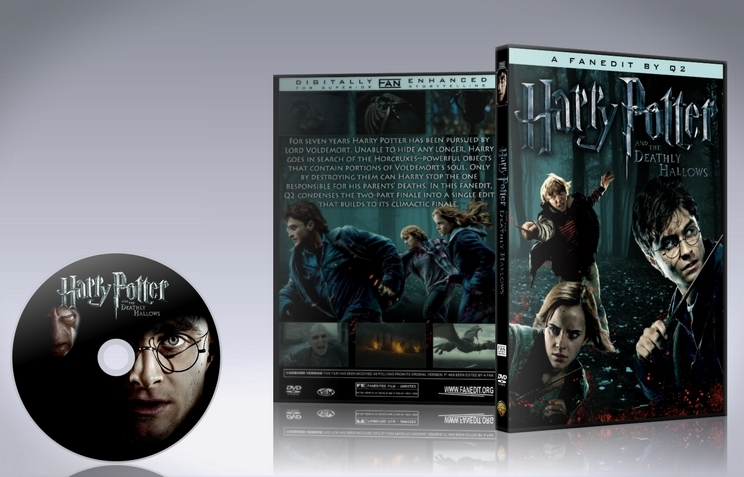 I have to say it's much easier to watch Deathly Hallows, while both good movies, I just hate sitting through part 1. This edit seamlessly edits the two films together into one coherent movie. Visual this fan edit is pretty good. I have no complaints with how Q2 edits, this is pretty close to how I would do a Deathly Hallows fan edit (thanks Q2 for saving me the work!) The audio is top notch, when I first got into fan edits, all the audio was either too high o too low. Q2 hits the nail on the head with this one. I highly recommend giving this a chance! It took 1&2's place in re-watches for me. Time and time again I find myself giving the Potter films another chance. With every new viewing I wish for the movies to somehow improve. Either by discovering cinematic choices I neglected the previous viewing, or by a newly discovered emotional chord within. Sadly, the result is always the same: Apart from PS, CoS and most of PoA, I don't enjoy the Potter films. The fourth and fifth are what they are, and the sixth is the-one-which-must-not-be-seen. 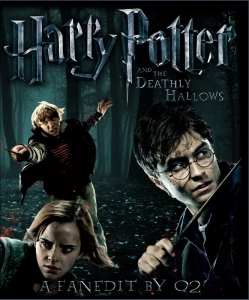 HP and the Deathly Hallows (both of them) contains more story yet manages to a) feel too long and b) feel rushed. An achievement, if nothing else. The writing in some parts is atrocious, especially the "Seven Potter"-sequence and its explanatory, stiff and hastened dialogue. Furthermore, the Potter/Voldemort hide-and-seek climax, from its beginning in the courtyard to its inevitable end, is vile. A putrid mess and a massive change so emotionally different from the source I can only goggle at it in disbelief. Context complete. Q2 possesses a damn fine skill set, as this edit displays. Impeccable cutting, slicing and editing of both audio and video. What he cut I didn't miss. Most of it gave the film a pleasant pace and a admirable tightening. Regarding the narrative I can only agree with aztek463's note about the cursed name of Voldemort. Unfortunately, the removal of some stuff (i.e. the admirable tightening) leaves less time in between the poor writing. Thus, it becomes more noticeable. On the one hand the edit is superb, on the other it makes the film even less enjoyable to me (and thus the rating). While I can revel in Q2's amazing work, I cannot enjoy the movie. Everything is pure quality from Q2 and he deserves all the praise. Alas, my enjoyment of his edit and skill as a fan editor is lessened by the very subject Q2 edits. Nevertheless, it is an edit I want to recommend for those seeking a perfect edit of a film they enjoy and are familiar with. I must say i never liked DH part 1 because it is boring and long with little action, and you did an amazing job at it. It flows smoothly. These are the reasons to why i won't give a 10 in narrative. Tank you so much for removing the end scenes where they are "old" and send of their children to school! Awful scenes bahhh! PS: I know that the movies get a darker color after third movie (i think), but i in my opinion it gets too dark that i always have to change the contrast and brightness lol. This is just a general comment. Wow. What an edit. The A/V quality was on par with the official BD releases, and for such a long film on a 25GB disc (bearing in mind the increased bitrate and resolution) this is quite an accomplishment. The visual editing was perfect. From masking out the "Part 1" at the beginning to just regular cutting (of which there is lots!) everything is in order. No stray frames, awkward jump cuts, or anything else that might pull one out of the experience. Disregarding the cut issue brought up by thecuddlyninja that Q2 is working on fixing, the audio was spot on. Sync was good, levels were good, especially where a deleted scene was inserted about halfway through. - When Ron left, he wasn't gone nearly long enough for his return to have much impact. - There was a deleted scene that ought to have been in the theatrical cut about why Harry and company stop using Voldemort's name and why the Death Eaters come running (flying?) when Mr Lovegood says his name. That said, I highly, highly, HIGHLY recommend this edit. 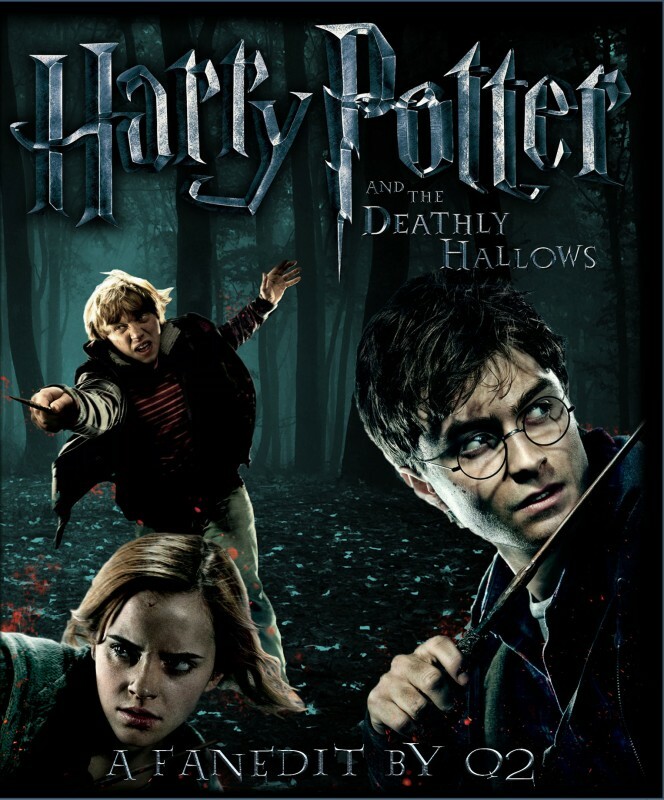 I've already recommended it to a good friend who is also a Harry Potter fan (before I even finished watching), and any Harry Potter fan who doesn't watch this is seriously missing out. A/V Quality - 10 - Watched the blu-ray; looked like my blu-ray. Visual Editing - 10 - Seamless editing throughout. Very professional job. Narrative - 10 - I don't think I missed anything that was cut. The focus of the narrative is really put 100% on Harry, which made the whole film work better in my opinion. Enjoyment - 10 - Loved it. This completely replaces the theatrical cuts for me. Reeeeeeeeeeeeeeallly minor nitpick which doesn't matter at all: During the end credits, the background is not fully black. Between some of the names, it flashes to pure black for a second then back. Thanks, Q2 for making the definitive HP finale, in my opinion. Thank you for the review! I'm happy you enjoyed the edit, though I must admit I'm embarrassed I never corrected that audio transition. I will fix it and get new copies up as soon as I can.